Espresso with a sidecar at Andytown Coffee Roasters on Taraval. The customary shot of sparkling water served alongside a demitasse cup of (third wave) espresso: we can’t see it disappearing any time soon. Espresso doesn’t deserve the accompaniment any more than a cappuccino or macchiato, and yet, do we know why it’s singled out to receive the accompanying shot? 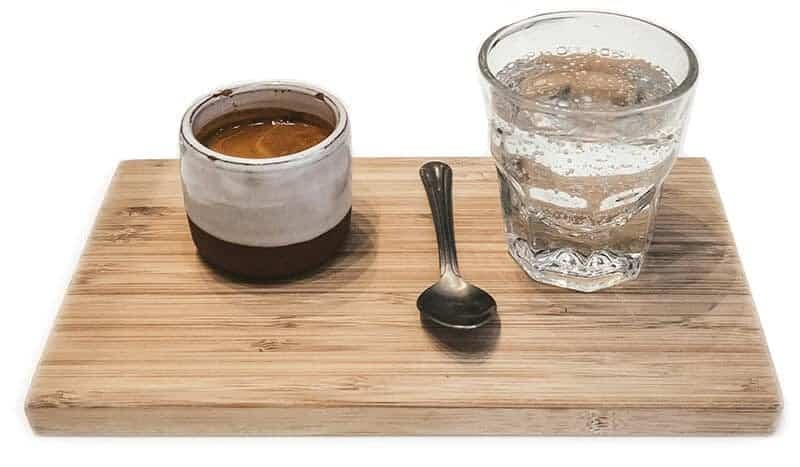 There isn’t an explanation on café menus, nor are patrons typically advised when ordering an espresso that they will also receive a complimentary glass of sparkling water. It just shows up. Is this a tradition, and where and why did it begin? “You don’t want to straight-chase it—that’s not why you drink espresso,” says Jason Reed Miller, director of coffee at Mazarine Coffee in San Francisco’s bustling financial district. Miller believes that you can always tell the quality of a coffee shop’s coffee by whether a patron drinks the sparkling water sidecar before or after they take their last sip of espresso. Miller believes the emergence of the glass of sparkling water can be attributed to third wave cafés: “They’re about hospitality and service as much as they are about high-quality coffee and dialed-in shots.” He suspects that one of the reasons why a lot of espresso drinkers prefer the water is because it can be enjoyed in-house, alongside the auditory pleasures of music streaming from the speakers and espresso served in a tactile, ceramic vessel. The act of serving water as an unexpected accompaniment expands the experience of drinking espresso in a café. Many people think serving the sparkling water is a carryover from Italian espresso bars. Interestingly, though, Miller hasn’t seen sparkling water served with espresso at Italian cafés or in Italy. According to Cho, when barista competitions were established in the late 1990s, it was determined that when coffee was served, part of the hospitality was to serve water and a napkin and to offer sugar. It was done as a certain degree of practical hospitality. The acculturation of specialty coffee standards and values started with the 2007 World Barista championship. For Cho, it’s really a question of how barista competitions have influenced specialty coffee. “Before those presentations went online, you didn’t have a way to see high-end specialty coffee service. All of a sudden here’s everything on display for people to experience.” He remarks that it’s the same origin story for [modern] cappuccino milk foam and single-origin espresso. “As much as the competitions should reflect what’s happening in the industry, there is a bad radar-rebound effect, where it’s what’s actually happening at the competition that gets reflected at the cafés, afterwards.” Serving single-origin espresso was a game changer. Cho hopes that “we’re on the tail end of coffee coming out of its adolescence phase. So much of it is proving we’re different from our forebears, proving we have our own identity.” Part of that maturity is coming back and starting to establish what your values are and why you do things a certain way. For now, the sparkling water sidecar is fashionable; we can only ponder what comes next.